18K pink gold case, diamond bezel, open ruthenium dial dial, hand-winding calibre 947 movement with minute repeater, barrel torque indicator, power-reserve, approximately 15 days of power reserve, alligator leather strap with deployant buckle. Water resistant to 50 meters. 18K pink gold case, open ruthenium dial, automatic calibre 947 movement with minute repeater, barrel torque indicator, power-reserve, approximately 15 days of power reserve, alligator leather strap with double folding buckle. Water resistant to 50 meters. 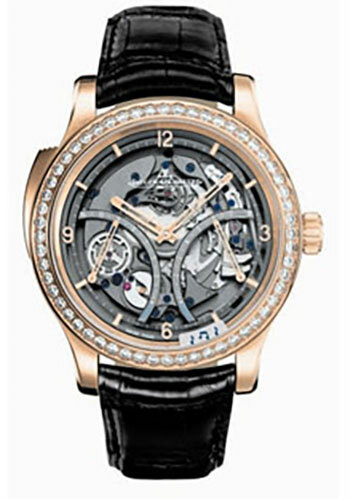 Platinum case set with diamonds, silvered sunray-brushed dial with silvered numerals and hour-markers, hand-winding calibre 947 movement with minute repeater, barrel torque indicator, power-reserve, approximately 15 days of power reserve, alligator leather strap with double folding buckle. Water resistant to 50 meters. Platinum case set with diamonds, open grey dial, hand-winding calibre 947 movement with minute repeater, barrel torque indicator, power-reserve, approximately 15 days of power reserve, alligator leather strap with double folding buckle. Water resistant to 50 meters.